Today we take a look at the most prominent Phillies player on the 2017 Hall of Fame Ballot, Pat Burrell. For close to a decade Pat Burrell was fixture in the Middle of the Phillies batting order. The 2009 UD card featured here honors one of those games. On October 5th 2008 the Phillies defeated the Brewers 6-2 in game 4 of the NLDS. The W clinched the franchise first Postseason series victory in 15 years. 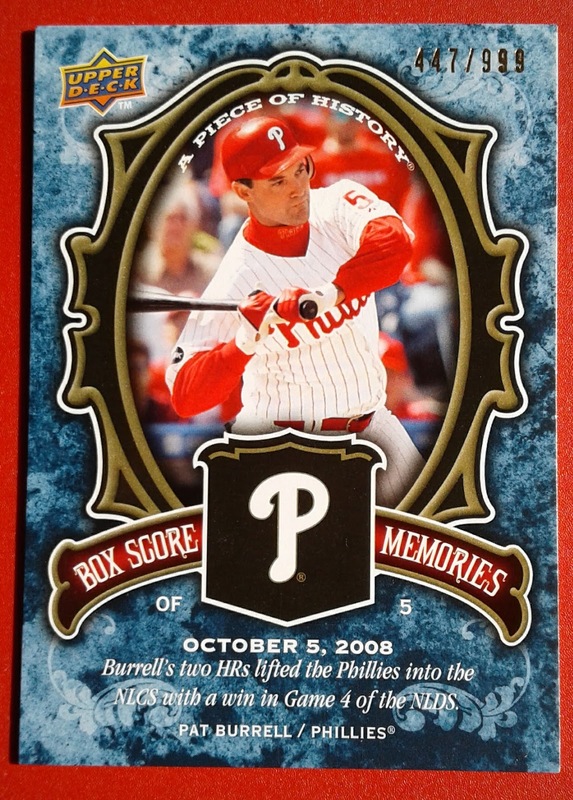 Pat Burrell was the offense hero of that game going 3-4 with a pair of Homers and 4 RBI. The big blow was a 2 out/2 strike three run homer in the third. 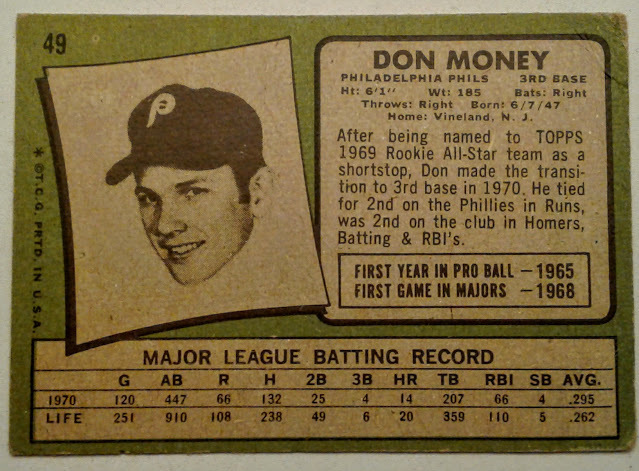 The shot gave the Phillies a 4-0 which they never relinquished. Burrell led all players in Win Probability Added for the game with a healthy 0.282 number. The 3 run homer accounted for 23 of those 28 points. 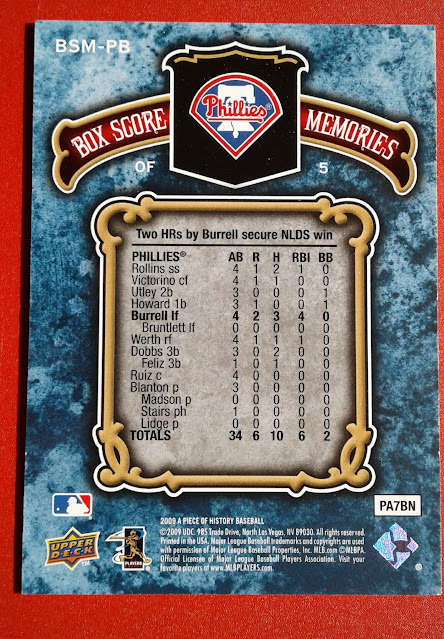 Back of the card has a nice box score with Burrell Boldfaced in the #5 spot in the batting order. Other noteworthies in the box are Jimmy Rollins who Homered to lead off the game and Jayson Werth who hit a dinger immediately after Burrell's 3 run blast. I have one other complaint. That is on the front of the card - The Phillies and Brewers played this game in Milwaukee, wish that UD would have selected a photo Burrell in an away uni. It is one of those things that I am OCD about on baseball cards - especially cards that are "inserts"
Hell Yes Hall of Fame! Philly Show returns to Valley Forge this weekend. The Philly Show is back in Valley Forge this weekend. Busy times at HQ right now, Not sure if team Phungo will be able to make the trek. I hope I get there as both of my favorite dealers are scheduled to be at the show. If anyone else is going let me know and I will keep an eye open for you. There are always autograph guests at the Philly Show, this edition of the show is largely football based, but there is one baseball player scheduled to appear, Don Money. 1971T finds Money at the peak of the five seasons he spent with Philadelphia. As can seen on his back stats he compiled 14 Homers along with a .295 average - In today's modern stats that would be a very healthy 123 OPS+ and a 3.5 WAR. There are a number of football guests at the show including Hall of Famers Jack Lambert, Lenny Moore (age 83! ), Gino Marchetti (89! ), and Herb Adderley. Famous Notre Dame alum Rudy will be there as well. The show runs December 2-4 and admission is $8. For more information on the show click here. Getting to the 2017 HoF Candidates a little late this year. 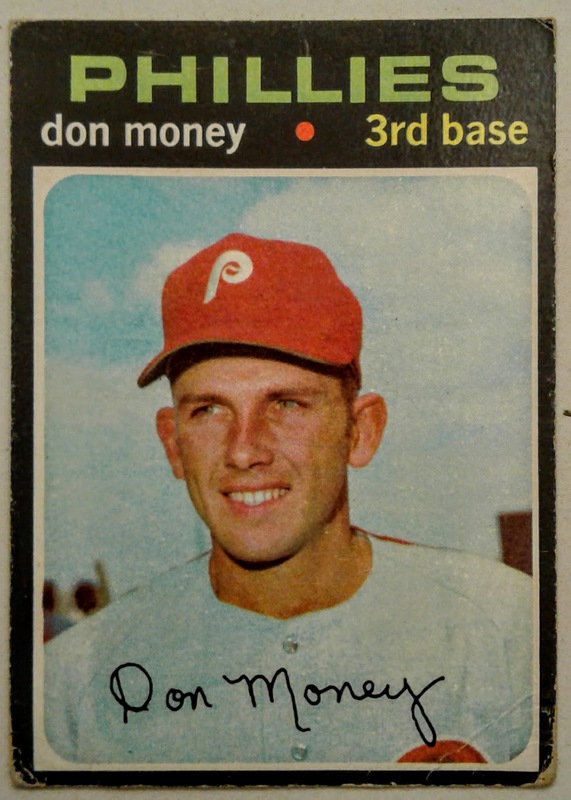 There are at least a half dozen players I would like to profile including a couple of prominent players who spent time with the Phillies. 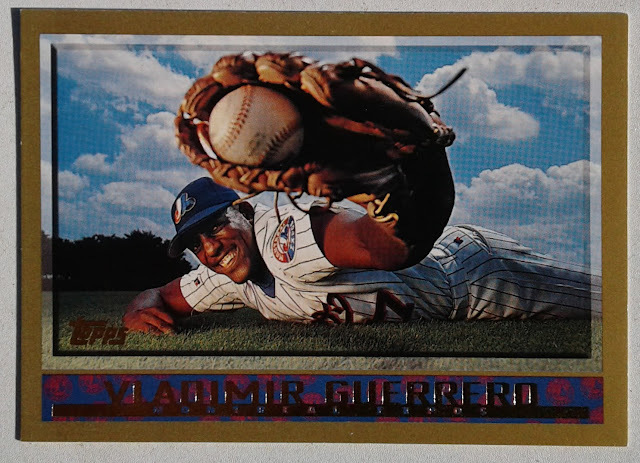 We open this series with a longtime member of the Phillies division rival Montreal Expos, Vladimir Guerrero. Vlad deserves HOF nod just for this card alone. One of my gripes about recent Topps is the plethora of action shots. While 1998T might not have the best design, at least there is some interesting variations in the photography. The text on the back discusses a play early in Vlad Guerrero's career where he scored from second on a sacrifice fly. 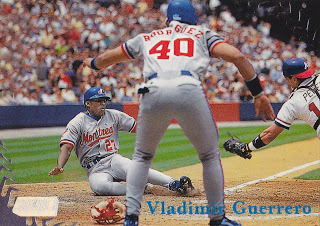 The run gave the Expos a 2-1 lead versus the Braves and future Hall of Famer Greg Maddux. Unfortunately for Montreal Ugueth Urbina would later give up a 2 Run Homer to Keith Lockhart which would give Atlanta a 3-2 victory. 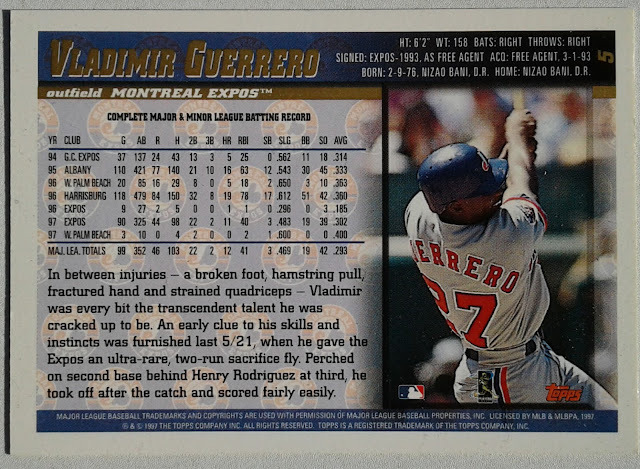 Regardless the rare 2 base sacrifice score gave us a glimpse into the talent of the young Vlad Guerrero. The fly out came off the bat of Doug Strange who hit the ball to Right Fielder Michael Tucker. A nice analysis of this card was done by the fine crew at Play at the Plate (who else). I may need to add this card to the Phungo Collection just as a companion for the 1998 Base card. The scoring from 2nd on a Fly Out is the kind of hustle that makes one want to cast a Yes HoF vote. Welcome to the HoF Eric Lindros! Nobel Prize Winner: Bob Dylan? Topps Now #362: Thanks Phillies Room! !